Are there any missing files in my WordPress installation? At times, you may notice your WordPress site runs slowly or doesn't run as well as it should on DreamPress. There are several reasons this can occur. This article describes some of the basic steps you can take to address issues that commonly lead to slow or inefficient websites on DreamPress. DreamPress comes with built-in server caching. Caching creates static versions of your site, which means a lot less has to be processed by the server when a customer visits your site. This allows your site to load faster and also helps manage larger amounts of traffic. 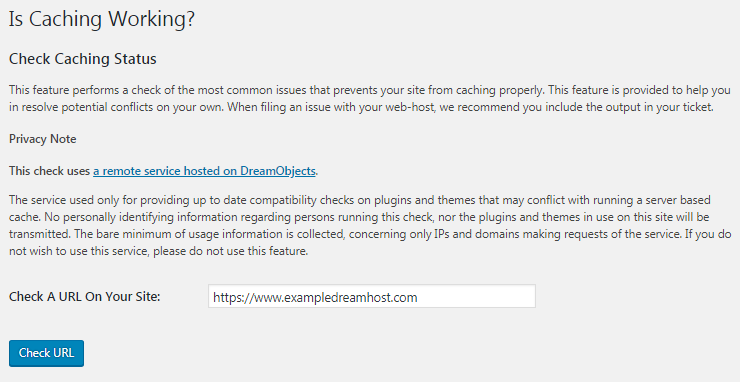 Many guides, including DreamHost’s, recommend caching plugins such as WP Super Cache on WordPress sites. However, since DreamPress comes with built-in caching, a third-party caching plugin such as WP Super Cache is not necessary and could even conflict with the DreamPress cache. You should, however, keep an updated version of the Proxy Cache Purge plugin installed on your DreamPress site. This plugin provides tools to manage the DreamPress cache automatically and analyzes your site’s ability to cache. Is my site using the DreamPress cache effectively? Due to the thousands of plugins and customizations available for WordPress sites, not all sites automatically work effectively with all caching methods. The Proxy Cache Purge plugin offers an option in your WP-Admin panel for you to check page URLs on your site to make sure they are caching successfully. If a page on your site is not caching, the 'Check Caching' option tells you the items you can check that may resolve this issue. Open the WP-Admin page for your DreamPress site. Click the 'Check Caching' option. Enter a URL in the 'Check A URL On Your Site' field box, and then click the Check URL button. This feature auto-scans the URL you selected and reports back any issues it finds as well as any known problematic plugins. Certain plugins might be written in a way that interfere with proper caching of your site’s pages and content. You can use the 'Proxy Cache > Check Caching' option mentioned above to identify a specific plugin that can cause this interference. While the available themes on wordpress.org are free and safe to use, some are better than others. When shopping for a theme, be sure to search online to determine if any users have complained about speed issues when using it. These results can greatly help you determine which theme is best for you. 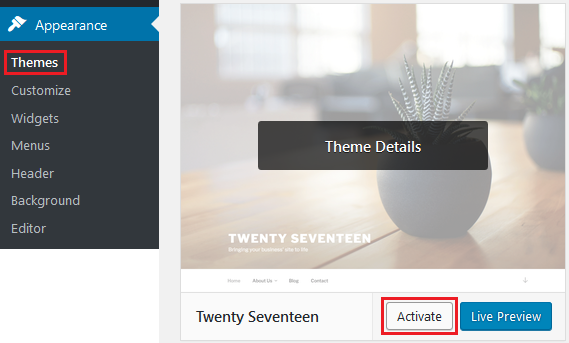 A quick way to check if your theme is causing issues with your site is to revert back to the default theme (such as 'TwentySeventeen') and see if that resolves any issues with your site. 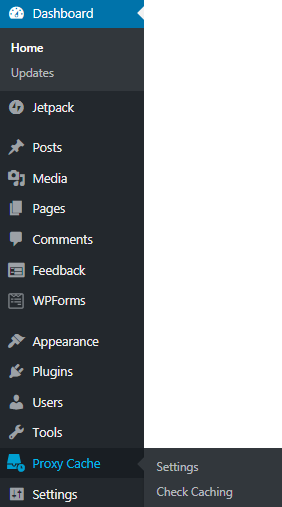 Log into your WordPress site's panel. In the left pane, click 'Appearance > Themes'. Search for the default 'TwentySeventeen' theme. Once your site is using the TwentySeventeen theme, use the tool mentioned above to check if this improves your site's performance. If you’re thinking about a new theme, select DreamPress plans offer a free subscription to Jetpack Professional (a $299 yearly value) which includes premium themes specifically selected by the Jetpack team, which are free to use for as long as you maintain your subscription. You should routinely optimize your site's database to avoid a "fragmentation" effect. The simplest way to do this is to use the WP-DBManager plugin which includes a function to optimize your database as well as the ability to schedule this optimization to run at a desired time (recommended once per month at least). View the 'Managing WordPress plugins' article for instructions on how to install a plugin. Then, click 'Database > Optimize DB' in the left pane. In the center pane you'll see a list of your database tables. Click the Optimize button at the bottom. You can also use wp-cli to optimize your database. In addition to optimizing your database, it's useful to check the size of your wp_options table. Typically this table should be under 1 MB, but plugins and other customizations can make this much larger. You will typically notice some slowness on your site if this table is over 3 MB. Your WordPress installation may be missing certain key files. This can result in 404 errors and can cause a server to work harder than normal as it tries to find them. This results in considerably slower load times, especially on popular websites. One of the most common missing files is the favicon (favicon.ico) file. DreamHost automatically generates a blank favicon for all domains by default, but if you notice it's missing, you can easily create a new one. The 'touch' command creates a blank favicon.ico file. A blank icon is far better than one that is missing, since your server will not work harder looking for it. To check for any other missing files, you can run your site through Pingdom Tools. A single pass through the site shows you any missing files that can cause your site to load slowly. Simply look for filenames in red and then either replace them or remove references to them in your themes or posts. There are various online tools you can use to analyze your website. These types of tools can provide insights into how your website is performing, identify issues that are causing your site to load slower than expected, and even recommend solutions to help you troubleshoot further. Firebug — A very handy tool that displays what is loading and how long it takes. YSlow — A companion to Firebug that can provide some pointers on what to fix and how. Web Inspector — Built into Chrome and Safari, it provides much of the same information as Firebug. Load Impact — A load testing service that hits your server with many simultaneous users. The free version provides a 50-user test. Be sure that you have caching enabled before running it. During this process, you can watch the CPU load with 'top', RAM levels with 'free -m', or both with 'vmstat 1' (Ctrl-c to stop). Article last updated April 14, 2019 22:39 PST.